The E 140.3 X-TRA is a domestic pressure washer, which offers, along with a good performance level, a high level of comfort, flexibility and user-friendliness. These pressure washers are super cleaning machines for all types of medium to high frequency outdoor cleaning tasks around the house. 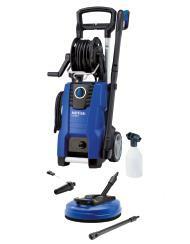 Perfect for cleaning 4x4 vehicles, caravans and of course the patio.